Who can explain the social aspect of garden blogging? There are no rules for blogging, and bloggers can do whatever pleases them. And what seems to please many garden bloggers is to interact with other garden bloggers in ways other than just leaving comments on each others blogs. We seek one another out. We want to compare blooms in our gardens, we want to share about gardening books we are reading, we want to commiserate when weather/bugs/rabbits affect our gardens, we want to get ideas from each other. Perhaps it is because so many of us garden alone and don’t know nearly enough gardeners in real life so we have a desire to connect with other gardeners online? Garden designer and writer Elizabeth Lawrence was renowned for writing letters back and forth with other gardeners to compare notes on flowers and bloom times and the how-to’s of gardening. So perhaps we are just doing what gardeners have always done, using online methods of communication? Regardless of how or why, there is no denying that there is a social aspect to garden blogging. Gardeners do want to connect with one another, through comments left on blogs, through emails, and even face to face. And once connected, they forge strong bonds with one another. Do other kinds of bloggers make this same connection and have this social aspect? Why do you participate in Garden Bloggers’ Bloom Day or the Garden Bloggers Book Club? Why did so many of us want to meet face to face at the Garden Bloggers Spring Fling? I turn the comments section over to all garden bloggers to provide their answers and insight. Carol, I think you are right when you wrote that we tend to garden alone. I know I like to read other garden blogs to see what they are doing and growing in their gardens because there are not many people around me who really garden. Blogging is a way to connect with people who share the same interests, and gardeners in general are very generous with their time and advice. I know people who garden but not with the same passion that I have. They plop in a few annuals or get a start now and then from a family member. But then they leave the garden alone for the rest of the season. One person told me, "I just don't get it. Why do you do this backbreaking work. The flowers are pretty,and all, but why?" That's why I blog, because other bloggers know why. I participate and communicate with other garden bloggers, because I have found them to be some of the nicest, most down to earth people I've ever encountered. With all of the negativity in the world, reading garden blogs is for the most part positive, delightful and uplifting. I enjoy seeing what others are growing, and I love flower garden and nature pictures. I'm so passionate about this post that I've written it three times and can't convey what I'm trying to say. I'm sitting here realizing that feelings aren't easily described. Let me just list a few words that come to mind. I haven't read many other kinds of blogs, I will admit. But the social aspect of garden blogging is definitely an attraction for me. I still get excited like a kid at Christmastime when a plant is about to open a new bloom--or when someone leaves me a comment, any comment, on one of my posts. Conversely, there are garden blogs (some of them very nice ones, too) that I have stopped reading so much and rarely if ever comment on because the gardener/blogger doesn't answer questions, even in comments, and doesn't seem to visit other gardeners/bloggers, either. It's not out of some fit of pique or spite... it's just that there isn't that sense of community bringing me back there and keeping me engaged. I blog to connect with people that are as obsessed with gardening as I am which means they know what I feel about my plants without too much explaination. Rather than trying to explain to someone why I am so excited about the first crocus of the season or the first fiddle heads showing up in spring. Gardening is an indescribable joy. I think that bloggers of other passions feel the same way. I have found that on my artsy blog the people that visit there are supportive and encouraging just as garden bloggers are. Actually they are more sensitive about giving advise. No one wants to hurt your feelings which can be done so easily with the written word. A lot of art wheter in the garden or in another medium is in the eye of the creator. Everyone likes to share their creations, like passing out chocolate chip cookies. There are always those that would prefer which chocolate chips and some that don't like nuts. I had given up gardening because apart from me nobody cared, and growing plants here is a hard job because summer are so hot (most of my garden has direct sun, to make things harder :-)). Last June, i went to Sweden and have rediscovered the joy of looking at pretty gardens. Back home, I've started to browse gardening blogs, as well as textile blogs (another passion). I was amazed by the openess of those blogs, and was thrilled to see the way bloggers would look at their garden, and at the world in general. Just as textile artists, by the way. At some point, I felt guilty to "take" from those blogs without giving back. This started me blogging, in September 2007. I'm not yet a good gardener, hardly consider myself as a gardener, therefore I hesitate to give advice. I'm rather the novice listening to wiser gardeners. For the moment, my comments are rather on how beautiful your gardens are. I hope I will someday switch to "look, I have a tip to solve your problem". Gardening is taking a greater part of my life, because it is fun to share it with you. I'm glad to share pictures with you, and to do so, I also do my best to have nice plants, not only for me but also for you. I'm weeding more often, for example. Trying to find a way to make compost, look at tiny things I had not noticed before, etc. And if I were not so far away, I'd do my best to meet some of you in persons. Great post, Carol! And from my POV, Robin said it all. 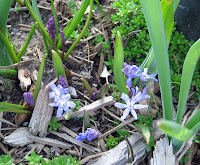 Gardening and garden blogging are wonderful antidotes to all the nagativity swirling around us via all forms of media. Go garden bloggers!!!! Carol, ...because no one but another garden blogger would 'get' smiling with delight while looking at your newly purchased plants in the rear view mirror as you drive home from the nursery. Garden bloggers are a rather supportive bunch, and I think people always want to meet and be friends with people like themselves, people who share the same interests and obsessions. We are social animals after all. I believe you hit the nail on the head. All of our neighbors don't garden...we hardly see them outdoors at all. We on the other hand are always puttering - they must think we're nuts as they wave when they pass by in their cars. Hermetically sealed in their houses and cars, they rarely open windows to let the fresh air in. It is amazing that they think one should live in a very narrow range of temperatures. As soon as the heat is turned off the air conditioner starts! No dirt under their fingernails. I think you're right. I started it as a journal because I felt that was important, then I discovered a world of people and knowledge that as a "newbie" I felt was more beneficial than any book. I love having something in common with others and it makes the world feel a little more "intimate." I'm very fortunate in that I have friends & family close by who love to garden, talk gardening & look at plant catalogues. They do not have, however, quite the same level of interest and/or expertise that I do. For example, I don't think any of them would bother reading Michael Pollan's "Second Nature." For that level of fanatacism (& I mean that in a good way), only garden bloggers provide a meaningful connection. Besides, I've seen (or even worked in) my social circle's gardens - I love seeing what's growing all over the place & the great ideas floating around out there. It's interesting that nobody mentioned anything about gardening clubs. When I first began gardening I was a member of a gardening club, and we did things like organize garden tours, exchange plants, have meetings with speakers, distribute a newsletter. Some of these things sound a lot like the things that garden bloggers do. I am not a member of a garden club now. I wonder if other bloggers are members of clubs or if blogging somehow fills the place of that. I would also like to mention that when I first began blogging over five years ago there were not very many garden bloggers. There were some though and I got to know a few who I have stayed in contact with all this time. But in general I think blogging has undergone a change since then. It is less "geeky" for one thing. The software itself has become easier to use. It has taken me by surprise that there are so many garden bloggers now and that they are a lot more "social" than bloggers were five years ago. This is an interesting post! Bill above pointed out the garden club role in supporting gardeners -- a good insight. I started a garden club at my previous employer, it was great fun, I enjoyed it greatly. We had speakers over lunch, organized trips to member's gardens, and had a huge plant swap every spring. When I moved to a new job, I really missed my club, but did not really find any interest in beginning a new club. Now, blogging partially fills that void. Blogging also allows me to stay in touch with far-flung friends and family. If I go to long between posts, I hear about it! Gardening is a pretty solitary activity, so it's fun to have the company sometimes. The mommy bloggers seem to form some pretty tight bonds themselves, except when they get into fights and block each other from their sites! Somehow I can't see garden bloggers doing that. And of course our flowers will never end up in therapy because we humiliated them by posting their photos on the Internet.